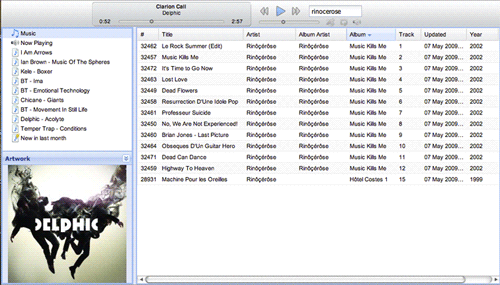 Web interface works with 40,000+ tracks, with sorting/searching, Unicode, smart playlists etc. Mar 2013 - I have had a couple of reports that this won't play to an Apple TV or to a Denon AVR with Airplay. I've primarily been testing with Apple Airports (the original ones). While sometimes I lose the connection to the speaker after an hour or two, I've been unable to determine why - my current thinking is this is down to network dropout, as I'm struggling to reproduce it when qTunes and the Airport are both connected via a wired network. Jun 2011 - the codebase is working well, with all features above working as described. At this point no further work is anticipated. Download the source (from Bazaar or from the links below), ant onejar, copy the example/qtunes.conf file and edit it to reflect the path to your music folder, then java -jar dist/all.jar path/to/qtunes.conf. The web service will announce itself via Zeroconf/Bonjour, but typically it's http://localhost:3679/webplayer/static/index.html. MP3 works out of the box, if you want MP4 see the README for details on how to install. And finally, this code is in no way endorsed or approved of by Apple, and I have no connection to them (although I do seem to have a lot of their stuff). All trademarks are property of their respective owners.